With Sitemagic Cloud you are free to take your website elsewhere anytime you want. First you need to create a backup of the data. To do so, log in and navigate to Admin > Cloud Account. Click the Create backup button. Within minutes you should receive a link to the backup containing all the necessary data. Install Sitemagic CMS using the Web Installer. Import the database tables from the backup (in the file data-[yyyy-mm-dd].sql) using e.g. PHPMyAdmin. On the new Sitemagic CMS installation enable MySQL, but do not create the database tables. Transfer the content of the two folders files and templates from the backup to the new Sitemagic CMS installation. 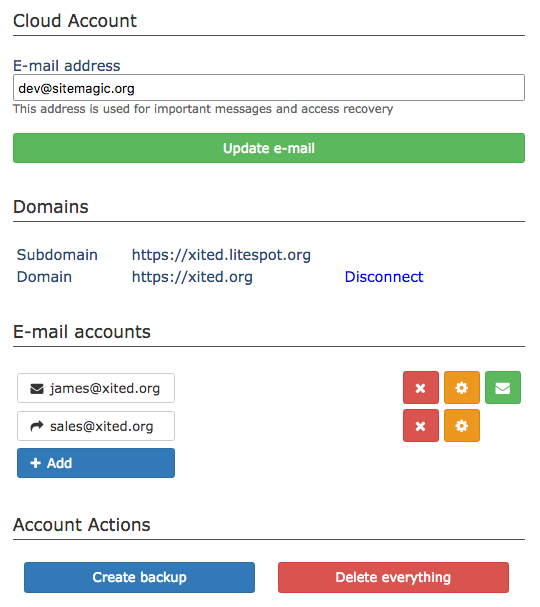 Transfer the file .htaccess (it might be hidden) to the root of the new Sitemagic CMS installation. That's it. Your website should now be up and running again. When you are absolutely sure everything works, make sure you remove your website from Sitemagic Cloud using the Delete everything button. You may have to contact your domain registrar to move your domain to your new hosting provider, if you previously connected it with Sitemagic Cloud.